Trebbiano d’Abruzzo is the region’s white-wine partner to its iconic red Montepulciano. Illuminati’s Costalupo is one of the top examples offered at a great price. Straw yellow in color with greenish reflections. Fruit-forward. It offers delicate aromas of citrus and stone fruity and hints of white flowers. Dry with a refreshing, crisp acidity. Perfect for quaffing, it will also pair well with delicate dishes such as appetizers, seafood salads, linguine alle vongole (spaghetti with clam sauce) and soups. 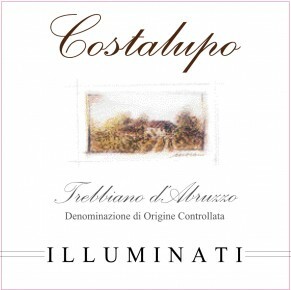 Illuminati’s Costalupo was previously labeled as Controguerra Bianco DOC and presented as a blend of 70% Trebbiano along with Passerina and Chardonnay. Starting with the 2013 vintage it is labeled with the more consumer-friendly appellation of Trebbiano d’Abruzzo DOC (as allowed by DOC Rules for wines made from at least 85% Trebbiano) and features clear bottle. Grapes are harvested in late September, de-stemmed and crushed softly. Fermentation takes place in stainless steel tanks at controlled temperatures.